from SCCT PR, PLACERVILLE, Cal. 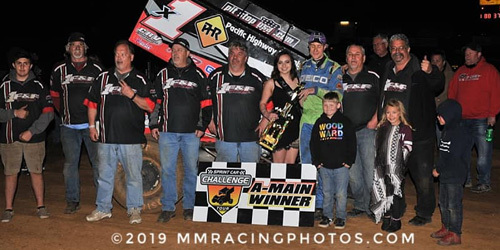 (March 30, 2019) – Nobody has captured more Winged 360 Sprint Car wins in the storied history of Placerville Speedway than Andy Forsberg but going into last night he had yet to win a Sprint Car Challenge Tour event. That all changed in a big way with the Auburn, California driver holding off a fast closing Sean Becker to pick off the $4500 top prize during the season opening “Spring Fever Frenzy” for the third year series. It was the 59th career Winged 360 Sprint Car triumph for Forsberg at the track and came aboard the familiar Friends and Family Racing/ Econo Lube N’ Tune & Brakes X1 machine. Also sharing Placerville Speedway victory lane on Saturday night was veteran racer Scott Kinney with the BCRA Midget Lites. Early in the 35-lap Sprint Car Challenge Tour presented by Elk Grove Ford and Abreu Vineyards feature it looked as if young Tanner Carrick would walk away with things. The 17-year-old got out front after claiming victory in the High Sierra Industries Dash and looked ultra-impressive running the high-scary side of the quarter-mile. Drivers battled for position behind him as the bullring got a little rough and choppy in various areas but made for entertaining racing throughout. Carrick’s bid for victory came to an end on lap 14 however, when he got over the edge in turns one and two and spun to a stop. Despite the tough ending the Lincoln driver continues to impress during his appearances at Placerville Speedway. Hanford’s DJ Netto inherited the lead for the restart, but Andy Forsberg made his presence known by executing a bold move down low to sneak by both Netto and San Jose’s Tim Kaeding for the lead. One lap later Netto slowed with a flat right rear tire and shortly after that Kaeding did the same. The remainder of the race saw all eyes on Roseville’s Sean Becker who charged forward from his 10th starting position. The “Shark” rocketed around the speedway in impressive fashion and made several daring passes, keeping fans on the edge of their seats. When the white flag waved Becker closed on Forsberg and made one final attempt in the last corner, but Forsberg fended him off and crossed the Ron Stahl checkered flag to claim the big victory. Becker came home in second and Hanford’s Mitchell Faccinto rounded out the podium. Mather’s Kalib Henry had a fine run in the feature to finish in fourth, while Fremont’s Shane Golobic completed the top-five. The remainder of the top-10 was comprised of Aromas, CA’s Justin Sanders, Hollister’s Tony Gualda, Paradise’ Kyle Hirst, Foresthill’s Ryan Robinson and Hollister’s Ryan Bernal. Gualda earned the Pit Stop USA Hard Charger Award by carving his way from 22nd to seventh in the feature. Robinson should also be commended for passing the same number of cars to go from 24th to ninth. Bernal captured the Ti 22 Performance B-main and as mentioned T. Carrick won the High Sierra Industries Dash, which paid $250-to-win. All Star Performance Heat one went to Carrick, A.R.T. Speed Equipment Heat two was won by Tim Kaeding, BR Motorsports Heat three was snagged by Willie Croft and King Racing Products Heat four went to Mitchell Faccinto. Tony Gualda opened the evening by earning the Quick Time Mortgage/ ADCO Driveline and Custom Exhaust Fast Time Award, clocking a blistering fast 10.486 second lap. A total of 32 cars were on hand to open the season for the Sprint Car Challenge Tour. The companion BCRA Midget Lite feature was claimed by Scott Kinney and it certainly showcased its fare share of excitement. Kinney battled hard for the lead with son Hunter in what was a thrilling display of midget lite racing. The two went side by side on multiple occasions, but on lap 17 things got a little too close for comfort. It resulted in Hunter getting upside down in turn one. He was okay but done for the night. S. Kinney went on to take the checkered flag over a very fast Terry Bergstrom, Danica Joe Parker, Jeff Griffin and Josef Ferolito. The Placerville Speedway will now open the championship point season next Saturday April 6th with Law Enforcement Night. In action will be the Thompson’s Family of Dealerships Winged 360 Sprint Cars, Jay’s Mobile Welding & Fabricating Pure Stocks, Mini Trucks and the Hunt Magnetos Sprint Car Series. 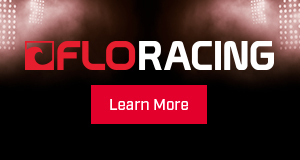 The Sprint Car Challenge Tour presented by Elk Grove Ford and Abreu Vineyards will head next for the much-anticipated Asparagus Cup on Friday and Saturday April 12th and 13th at the Stockton Dirt Track.